Students from the College’s Pre-Medical School, which is a specialist enrichment offered to those students who have ambitions to study Medicine at university, went on the trip. It was a follow-up to a workshop conducted at College back in April, when they completed a problem-based learning (PBL) exercise based around diagnosing a urinary tract infection and sepsis. 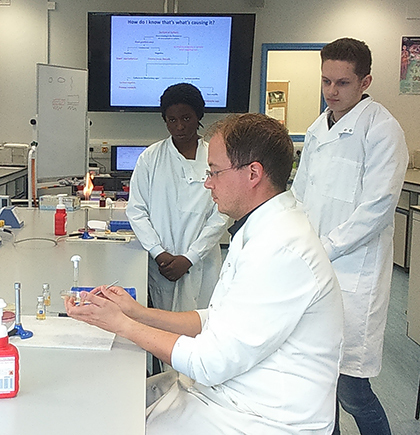 At Keele, the students took part in two practicals relating to the PBL case they were studying: one on microbiology and deciding which antibiotic to use, and the other a hands on anatomy session based around the urinary system. They had a working lunch, ion which they were able to discuss entry requirements and course structure and the day concluded with students discussing their research on the case with the doctors and the challenges faced when prescribing antibiotics. Doctors Andrew Morris, Margaux Horne and Gordon Dente were on hand to work with the students. As well as a Pre-Medical School, the College offers a number of other specialist academies that are aimed at boosting students’ university chances in particularly competitive fields of study. They include an Engineering Academy, Law Academy and a Shakespeare Academy.